Discussion in 'The Huntsman Knife Company' started by DL Robin, Mar 31, 2019. Hope you are well. I have and love my 12" 52100 machete. Use it for trail clearing, fire prep, and camp chores. Sometimes on hikes I want something a bit shorter but still capable to chop if needed. Have you considered making a short bolo or Leuku something in the 7-8" blade length range? 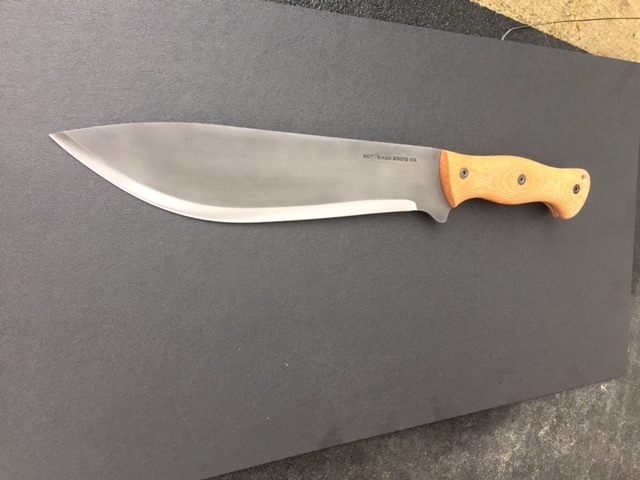 The shortest chopper I have made is the Fell Beast 10in. I also made a 12 or 10in true grass machete. As for Bolo's I made a 13.5in Bolo machete as well as the 3/16 thick liberator Bolo. I really liked the 13.5in Bolo machete. If I get back to making knives again its a model I'd like to explore. However, I think 10in blade is about as short as you can go before there is a big drop off in chopping power.